Shift in supply or rise and fall in supply. This article explains movement (extension and contraction) of supply. Price is an important factor of changing the quantity supplied by a seller. When the price of a commodity increases its quantity supplied also increases it is called the extension of supply. In opposite process, when the price of commodity decreases, the quantity supplied of it also decreases it is called the contraction of supply. It leads to the law of supply. In other words, all the changes in quantity supplied are resulting from the change in price factor, is called the movement of extension and contraction of supply. In this process, all other factors affecting the quantity supplied of a commodity are supposed to remain constant. The movement of supply is explained with the help of the following schedule. When the Px increases from $1. to 2, 3, and 4. the quantity supplied of 'X' commodity increases from 2 Kg to 4, 6 and 8 Kg of 'X'. It is called the extension of supply. In the opposite direction, the Px decreases and quantity supplied of 'X', also decreases, It is called contraction of supply. The movement of supply is further explained by the diagram. With the help of schedule, SS supply curve is drawn which has positive slope. When the seller moves from left to right upward, the price of 'X' increases and Qx also increases, it is called extension of supply. 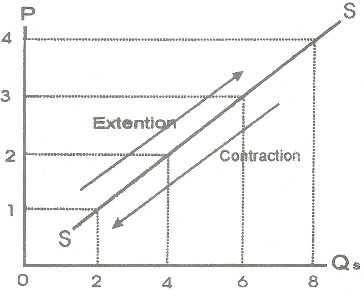 In the opposite, when the seller moves from right to left downward, the Px decreases and Qx also decreases, it is called the contraction of supply.